This is one of the classics in Haiti Election. 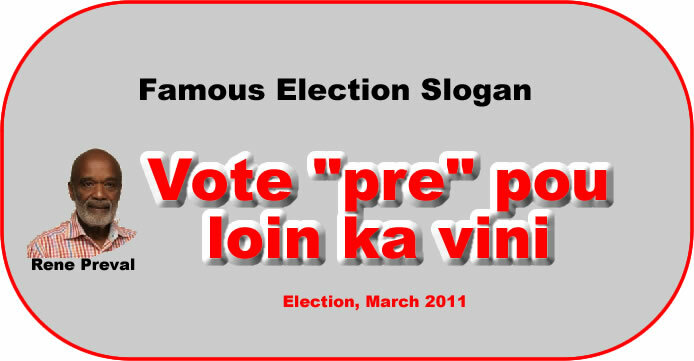 The famous slogan "Vote Pre Pou Loin ka vini" by Rene Preval. When Jean-Bertrand Aristide became the President in 1991, hundreds of thousand Haitians believed him as a prophet. The former leftist priest made promise for a radical shake up of the political and judicial systems. He also promised that he would stop the U.S from sucking blood of the Haitian people. However, very soon his malpractices and corruptions came into light. Even the public treasury was pillaged. The Haitian people were shocked to learn that the former priest was an alleged father of six illegitimate children, with five different women. Aristide was Haiti's first democratically elected president and three times he held the President's office (7 February 1991 - 29 September 1991, 12 October 1994 - 7 February 1996 and 7 February 2001 - 29 February 2004) until he was ousted in a 2004 coup d'état for the second time after September 1991 and was forced into a seven-year exile to Central African Republic. René Garcia Préval is a Haitian politician and agronomist who was twice President of the Republic of Haiti (February 7, 1996 - February 7, 2001 and May 14, 2006 - May 14, 2011). In 1991, when Aristide was elected president, Préval became prime minister. Following the 1991 military coup, he fled into exile with Aristide. However, he later succeeded Aristide in 1996. As a President, Preval managed very modest achievements during his first term. His welfare projects targeting poor earned him the prefix "Ti" (Little) René. In 2001, Preval became Haiti's first elected president to leave office after a full term. During his second term as President, his most efforts were hampered by the rising cost of basic foodstuffs, deadlock in the legislature, and the deteriorating condition of law and order. As a President, he also encountered the devastating 2010 earthquake.